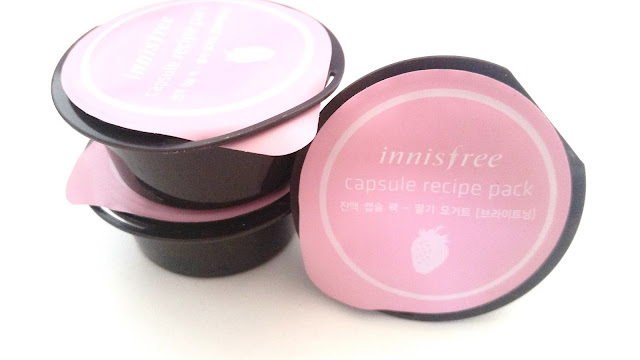 Remember how I said I would (eventually) review all of Innisfree's Capsule Recipe Packs? Well, I'm slowly working on it. 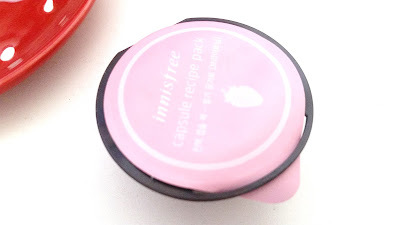 Today takes me one step closer because I am sharing my review of Innisfree's Capsule Recipe Pack in Strawberry Yogurt. 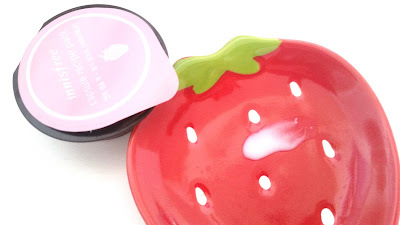 As someone who loves strawberries and strawberry related things (most of the time), I find myself drawn towards strawberry related skincare and makeup products as well. So naturally, I want to try them all. However, on this strawberry journey I've found that the 'strawberry scent' has way too many variations and not everyone of them smells as lovely as I would like. Still, I try some these strawberry products because there's usually something else about them that interests me. Like their skincare benefits, effects, adorable packaging, etc. That's how I chose to try these Innisfree Capsule Recipe Packs in Strawberry Yogurt. Product Description: A strawberry yogurt wash-off mask that's formulated to brighten and hydrate the skin. The wash-off mask is formulated with various fruit and root extracts to help brighten and moisturize the skin. To Use: Wash the face first. Take an appropriate amount and massage it evenly onto the face. Leave the mask on for 10 to 15 minutes, then wash off. Tip: give the face a light facial massage during the 10 to 15 minutes wait time. Facial massages can help to relieve facial muscles and increase circulation. 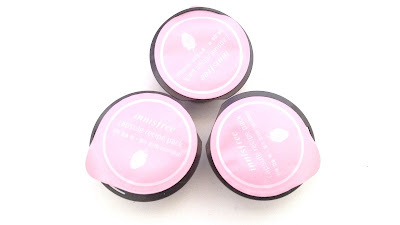 Ingredients: WATER,BUTYLENE GLYCOL, HYDROGENATED POLY(C6-14 OLEFIN), GLYCERIN, CETEARYL ALCOHOL, OCTYLDODECYL MYRISTATE, DIMETHICONE, BUTYROSPERMUM PARKII (SHEA BUTTER), POLYSORBATE 60, ULMUS DAVIDIANA ROOT EXTRACT, AMARANTHUS CAUDATUS SEED EXTRACT, YOGURT EXTRACT, CENTELLA ASIATICA EXTRACT, FICUS CARICA (FIG) FRUIT EXTRACT, PORTULACA OLERACEA EXTRACT, PUERARIA THUNBERGIANA ROOT EXTRACT, GLYCYRRHIZA GLABRA (LICORICE) ROOT EXTRACT, PAEONIA LACTIFLORA ROOT EXTRACT, CNIDIUM OFFICINALE ROOT EXTRACT, RUBUS IDAEUS (RASPBERRY) FRUIT EXTRACT, VACCINIUM ANGUSTIFOLIUM (BLUEBERRY) FRUIT EXTRACT, MORUS ALBA ROOT EXTRACT, FRAGARIA VESCA (STRAWBERRY) FRUIT EXTRACT, CITRUS UNSHIU PEEL EXTRACT, ORCHID EXTRACT, CAMELLIA SINENSIS LEAF EXTRACT, CAMELLIA JAPONICA LEAF EXTRACT, OPUNTIA COCCINELLIFERA FRUIT EXTRACT, SOLUBLE COLLAGEN, ALOE BARBADENSIS LEAF JUICE, HYDROGENATED LECITHIN, SODIUM HYALURONATE, 1,2-HEXANEDIOL, SORBITAN STEARATE, STEARIC ACID, GLYCERYL STEARATE, PEG-100 STEARATE, XANTHAN GUM, TOCOPHERYL ACETATE, CARBOMER, TRIETHANOLAMINE, ETHYLHEXYLGLYCERIN, DISODIUM EDTA, CARAMEL, PROPYLENE GLYCOL, CERAMIDE 3, ACACIA SENEGAL GUM, FRAGRANCE, PHENOXYETHANOL, RED 33. Please Do Not use if: you are sensitive to fragrance or any of its ingredients. Packaging: The packaging of these Capsule Recipe Packs and I have a love/hate relationship. They all look the same (except for the lid design) and they have the same perks and the same issues. The packs comes in a small black-brown container with a pull back lid. 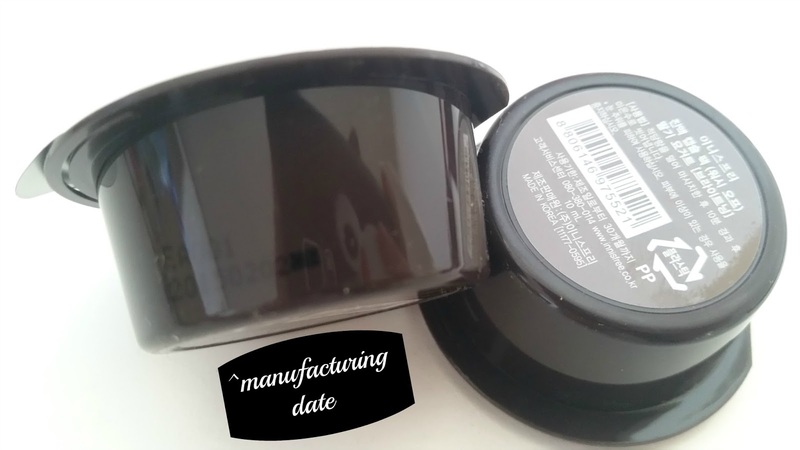 The lid (flap) has the product's name, designated color, and picture of the main ingredient. The container has some information on the back, but it's in Korean. The pack is designed to reseal itself and as you can see in the image above, there's a slit to insert the lid flap. However, that slit doesn't really help most of the time, so it's best to use something else to hold down the lid. Scent: Ah, the moment of truth. Does it smell like strawberry yogurt? Well, yes, sort of. For the most part, it does smell like strawberry yogurt. However, it really smells like strawberry yogurt candy but with a hint of fake strawberry scent. It doesn't smell bad and not strong at all. To be honest, I do like it. It's just not exactly what I thought it was going to be. Texture: The texture surprised me as well because it's a lot more liquidy than expected. Think Gogurt but a bit more runnier than that. I worried about drips but that didn't happen. Color: The wash-off pack is light pink in color. Its even lighter in color than the lid. My Thoughts: The first thing I did when I opened the pack was to smell it. I took a couple of sniffs, thought about it for a bit, then sniffed it some more. It didn't smell bad but it wasn't what I expected either. It had the strawberry yogurt scent but there was something else that I couldn't pinpoint at the time. (If you read the scent section above, then you already know what it is.) I decided to patch test it anyways and it turned out good. I realized what the scent was while at the grocery store (odd place, I know). The Strawberry Yogurt scent in this pack smells more like strawberry yogurt candy with a hint of fake strawberry scent in it. Ah, that was it I thought. I then proceeded to buy the strawberry yogurt candy. Anyways, as always, each pack is good for multiple uses. I can usually get between 4 to 6 uses out of each pack depending on how much or less of the product I use. 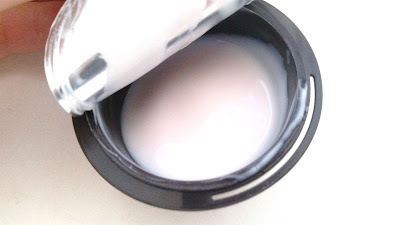 This Strawberry Yogurt pack promises to brighten and hydrate the skin, so I put it to the test. Did it brighten? Well, yes but not by a lot. I only noticed minimal brightening effects. I did leave the pack on for 30 minutes once, to see if a longer time can maximize the brightening effects. And, well, it didn't really add much, just a tad more. Luckily, it was gentle enough on my sensitive skin so it didn't cause any issues but I've abide by the 15 minutes mark rule since. Did the pack hydrate? Yup. That was the nice part. My skin usually feels nicely hydrated after I used the pack. It also feels softer afterwards too. I've probably mentioned this with every Capsule Recipe Pack review but I'll share it again. The resealing of this product needs a revamp. The idea is nice but the execution lacks greatly. Simply put, that slit doesn't really help at all with resealing. I always say to put another product on top to hold the lid in place or use a lid that's around the same size from another product. Final Thoughts: I like the scent of this product. It isn't what I thought it would be but it smells nice to me anyways, so no biggie. I wish the pack has better brightening effects to make this product more worth it. I wanted to try it for its brightening effects but was left disappointed. I do like that it hydrates my skin and leaves it soft afterwards. It's also easy to use and I like to do a light facial massage when I use it. Would I repurchase it in the future? I don't know. I'm torn because there are some aspects of the product that I like and some that I don't. I think if I don't find another great strawberry smelling wash-off mask that hydrates nicely and brightens better, I might come back to this one. Do I think this is worth a try? Yes. If you like strawberry yogurt candy scents and is looking for a hydrating wash-off pack, then this is a good choice. It's also inexpensive, so it won't break the bank either.